One aspect of the HSR project that we have so far paid little attention to on this blog is how the new service will be integrated with the existing Los Angeles Union Station. This terminal station with its iconic waiting room was built on a spur off the main line along the Los Angeles river before the war and is today a multimodal hub served by Amtrak, Metrolink, two Metro subway lines, Metro Gold Line light rail and multiple buses, including the FlyAway to LAX. Note the ramp for two light rail run-through tracks under construction for the Metro Gold Line Eastside extension. Separately, FRA published the final EIR/EIS for four heavy rail run-through tracks back in 2005. These would veer east to join up with the BNSF main line along the west bank of the Los Angeles river. These tracks would primarily be used by Amtrak Pacific Surfliner and presuambly, modified Metrolink lines. The HSR level would itself be a terminus station without run-through tracks. Trains between San Francisco/Sacramento and Anaheim-Irvine/San Diego would have to reverse direction, as would trains between Anaheim-Irvine and San Diego. Diesel trains serving a covered grade level would create an air quality problem for passengers and staff. This will become less severe if and when Amtrak and Metrolink receive funds to switch to Tier 4 locomotives, but dirty legacy locomotives will probably remain in service through a long transition period. Significant forced ventilation may be needed mitigate the issue in the interim. Without an additional mezzanine level, pedestrian flow capacity could be severely restricted at the stub end. HSR trains can be 1320's feet (~400m) long and support over 1000 seats with bi-level cars. Construction of a second story capable of supporting multiple HSR trains weighing 400-600 metric tons each will cause significant disruption to passengers of the existing heavy rail services. Along with the ramp for the approach tracks, this will also be rather expensive. It may therefore make sense to consider an alternative involving the construction of a new Alameda Station, located about half a mile north of Union Station. A large area there is currently being undeveloped being developed as a State Historical Park as it contains archeological artifacts (h/t to bafg). In theory, it could support an at-grade station plus rail yard (e.g. for high-speed cargo trains at night) plus a number of transit-oriented commercial buildings. The new station would be linked to Union Station via the existing Metro Gold Line, supplemented by a new courtesy Metro Black Shuttle funded by a small surcharge on HSR tickets to and from Los Angeles. This would leverage the Gold Line tracks and Chinatown station but use new, private single-track stub spurs at either end. These stub tracks would have platforms to either side, one for level boarding and the other for level alighting, to facilitate rapid turnaround. The two drivers sitting in the cabs at either end would alternate to secure high service frequency. At peak times, two Black Shuttle trains would be in service, otherwise just one. Their schedule would have to be integrated with that of the Gold Line. The following map shows the location of the HSR station with its 10 platforms tracks and access connectors. These would permit run-through service north-to-south, north-to-north and south-to-south. Also note that HSR tracks would have to cross legacy tracks in one location. This can be implemented at grade with appropriate signaling to ensure FRA-mandated time separation in mixed traffic situations. UPDATE: an alternate location next to the Los Angeles river east of Union Station is now also indicated on the map. This would avoid the loss of the aforementioned State Historical Park. See also UPDATE 2 at the end of this post. To illustrate the concept, 10 HSR tracks are shown at the station. It would be possible implement fewer HSR tracks and add some run-through tracks and platforms for FRA-compliant trains (e.g. Amtrak Pacific Surfliner) instead. This option is not shown on the map. Neither is the option of transit-oriented office tower development north-east and south of the new station. Prior to station construction, a section of N Alameda street would need to be moved underground. Along with N Spring, Sotello and N Main Streets, this would afford vehicle access to the main station hall located east of the tracks. This corner of the station footprint could itself be a high-rise with office suites or a business hotel/conference center on the upper floors. There is room for an adjoining bus terminal. The mezzanine level above the tracks would provide generous pedestrian flow capacity, with multiple descents to each island and side platform plus paths to the Black Shuttle and Gold Line stations. Optionally, the mezzanine could house a shopping mall. If desired, one or more levels of for-fee public parking could be implemented on top of this, accessible from N Broadway via a flyover at the north end of the station. UPDATE 2: In response to comments from bafg and others regarding the State Historical Park, I've fleshed out the alternative of a new East Terminal for Union Station featuring ten run-through HSR tracks at grade, i.e. underneath E Ceasar E Chavez Ave next to the river. The HSR terminal would be connected to the main terminal via a short unmanned people mover running above street level. The new terminal has a mezzanine level, but only north of the people mover station. A green roof would still be useful in that it eliminates an air conditioning requirement. Optionally, the Metro subway lines could be extended one stop to provide direct service to the new terminal. Note that in this alternative, the diesel tracks have been relocated to near where the road begins to rise to bridge level. It may be necessary to create a slight dip for them to achieve adequate vertical clearance. Doing it this way minimizes the number of grade crossings between legacy and HSR tracks. The large building north-west of Keller Street need not be torn down. UPDATE 3: If CHSRA is forced to use the I-10 median for the Inland Empire/San Diego spur in phase II because UPRR refuses to offer its ROW, then the plan to build run-through tracks for HSR at the existing Union Station terminal would run into problems. A modified version of my original proposal that skirts the new State Historical Park would solve that. The northern approach tracks would run on an aerial structure above N Spring St, with a transparent sound wall to avoid impacting visitors to the park. The mezzanine at the station would then be at street level, the platforms above severely curved. I'm not entirely sure of the vertical configuration of the existing tracks in the "throat" into Union Station, but perhaps the ones for HSR could run above them to separate grades and avoid capacity constraints. Note that the Metrolink San Bernardino line already runs along in the I-10 median between the 716 Junction and El Monte. Also note that an HSR station in the I-10 median at Ontario airport would require an additional people mover to be of much use. The "undeveloped" land you describe is the Los Angeles State Historical Park, which the community fought for many years to get. If it is taken away we will lose a lot of political support for HSR. Not a smart move, and probably not even possible, given that the planned construction of the park is in progress. I attended a presentation of the Union Station plans a while back at the Downtown Los Angeles Neighborhood Council, and they had several options, many of which you describe, but one which you do not mention, which is the construction of an additional facility to the east of the current Union Station, where the Piper Technical Center is currently on Ramirez Street. There is an option to build an additional station there for HSR which would connect to Union Station via underground tunnels. Are there not enough tracks and platforms at LAUS ? looks like they could squeeze another set in. They should not spend all that money to build stub end raised tracks..and it would ruin the apperance of station , I did not know they had this planned. They really need it keep this whole project as simple as possible to have the best chance to build this on time and on budget.. The Germans are spending a lot of cash to turn the main station in Stuttgart into a through station. In their case, it's much more difficult than LA, because the solution is to rotate the platforms 90 degrees and place it all underground, fed by miles of new tunnels. Note that the VERY BUSY station only has EIGHT THROUGH TRACKS in its new configuration. LAUS currently has ten tracks, plus the two for light rail. Maybe the better investment is in improving the approaches, including building the run-through tracks, and widening the platforms. If necessary, build a new light rail station above the existing tracks and you could get ten tracks for rail with really wide platforms. A second and possibly third concourse under the tracks would be nice, too. The historic headhouse is beautiful, but the connection to the subway is REALLY awkward and the people congestion near ticketing is horrid. New facilities can be built in the new concourses, allowing the connection to the historic terminal to be relieved of overcrowding. LAUS is a gem, but it needs a lot of thought to transition to the busiest HSR station in California. I wasn't aware of the park project. However, as I said, the loss of the park could be compensated via a publicly accessible green roof. With appropriate construction and landscaping, this could support plenty of gazebos, shrubs and small trees, just not large ones. The fact that construction of the park is already underway does not mean that project could not possibly be suspended in favor of what I propose. However, I do agree that any such move would require substantial community input to ensure the end result still meets its needs. CHSRA would also need to speak up soon to ensure the city of LA doesn't spend money finishing the park only to tear it up again in a few years' time. A new station east of Macy St. would indeed also provide run-through tracks for north-south trains. Southbound trains terminating in LA would have to reverse direction, as would any between Orange County and the Inland Empire/San Diego. A 1/4 mile overhead or underground pedestrian passage with moving sidewalks could connect this to Union Station. That would be an acceptable alternative. However, new tracks at Gateway Plaza immediately east of Union Station make less sense to me. HSR stations with destinations in either direction should have run-through tracks. I've actually not seen or read anything specific on what CHSRA is really planning near Union Station. Note that they haven't produced an eye candy video, as they did for SF, SJ Diridon, Fresno, Anaheim and Sacramento. Considering LA is arguably the single most important station on the whole network in terms of ridership, that suggests there is no agreement yet on the solution to be implemented. Why not just plan to get some sort of FRA waiver for the station and build through tracks as planned? Failing that, underground HSR seems the best option if jamming more surface tracks in isn't reasonable. Finally, why wouldn't an elevated station be run through, it seems the easiest way to get around the Hollywood freeway in any case. Keep in mind that I've never actually been to LA, and am mostly watching this from the perspective of it being a precendent for what I'd like for Toronto - Montreal. 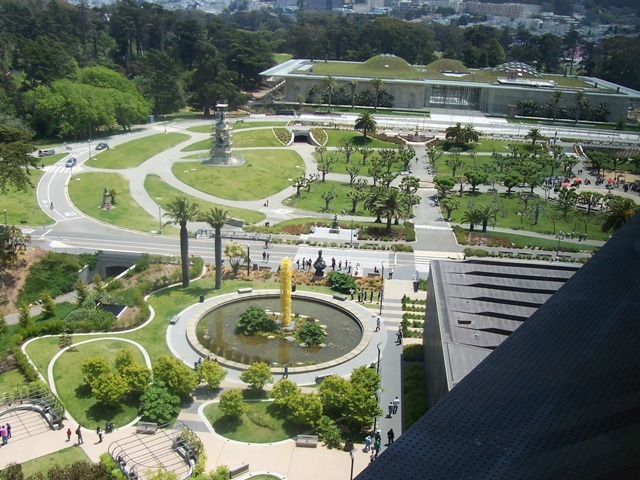 "the loss of the park could be compensated via a publicly accessible green roof." Rafael, this is not an option, despite the seemingly benign exchange you propose. The State Historical Park site was chosen for its historical value, it is filled with archeological riches which are to be unearthed, preserved, and displayed. It is the site of the Zanja Madre, the first water supply to the pueblo, and the earliest location of industry for the old city. Actual parts of the Zanja Madre has been found, and unearthed there. That part of LA has some of the least park space per capita, and that population has been denied basic consideration for many years (subject to extensive freeway construction, pollution levels, etc). All the options for Union Station as I understand them involve pass-thru tracks (except for a no-build alternative), including any new facility to the east. The presentation I saw also indicated that Union Station was originally designed for a second level, but that it was never built. The foundations can support it as far as I was told. I can appreciate your creativity however, looking at other possible options. I came across an alignment for HSR at Union Station not too long ago. It was likely from the CHSRA site itself. In fact, I think I have seen several 'like' pieces of work. I don't recall if one should have taken it literally, perhaps it was conceptual only, however, it illustrated an alignment largely parallel to existing platforms and as an airial structure. The approach from the south was more swooping and had larger turning radii on the curves. Overall, it looked doable. I'm unsure if the solution presented here is necessary. Not having the high speed rail station actually at Union Station in LA is, in my mind, the same as trying to end it at 4th & King in San Francisco. Union Station is the heart of public transportation in Los Angeles, and to not directly serve that with high speed rail would undermine the project as a whole. Further, the text of Prop 1A did state the high speed rail will connect the Transbay Terminal to Union Station. That being said, almost every incidence in which a train station has been built stub end has ended up being a problem. LA is not a terminus on the route at all; rather, it is a vital central station that ties together four different branches of the system, and the logistical headaches and time delays that will be caused by stub end configurations will be unacceptable at it. I think the best idea is what they are planning on - building above the existing tracks - but making it a through-track solution. The actual passenger boarding area of Union Station is relatively ugly, and with a good architect I am confident the CAHSR can harmonize a modern high speed rail boarding mezzanine with the historic Union Station. For the record, NC3D has made a video of Union Station for High Speed Rail. It shows Metrolink below an elevated high speed rail boarding platform. Interestingly, it includes two express tracks (i.e. no platform). I couldn't find this video on its own, so I uploaded a 1 minute long simulated ride from Anaheim to LAUS. The last simulation (with the Metrolink) is the renovated Union Station. However, your suggestion of a new underground level at Los Angeles Union Station would be very expensive, not least because the existing tracks must remain operational during construction. Run-through HSR tracks would then require tunnel construction near the Los Angeles river. A major earthquake could conceivably result in flooding. Constructing an upper level with additional run-through tracks would be expensive and possibly quite ugly. Stacking them on top of the ones already being built might be possible but in earthquake country, that sort of thing is definitely non-trivial. Besides, CHSRA will probably want on the order of 8-10 tracks, most if not all with run-through capability. Since high speed trains can be up to 1320' (~400m) long, that could put the platforms quite a bit north of the Hollywood freeway, increasing the gradient of the northern approach ramp. Also, there is little room for the horizontal section of the run-through tracks across to the river. FRA does not permit mixing compliant and non-compliant rolling stock on the same tracks. As it is, CHSRA will already have to get a waiver for parts of the Caltrain corridor and for the Fullerton-Irvine section of LOSSAN. I suspect they don't want to tempt fate any more than necessary. ah, historical artefacts could well be a showstopper for my proposal. At the very least, archeological digs can cause serious delays - especially if human remains are found at the site. Is the presentation you saw available online somewhere? nice video edit, but it shows the "generic station" contained in the gallery section of the CHSRA web site. Where does it say it actually reflects their plans for LA Union Station? I admit the Metrolink trains are a good clue, but the upper level appears to have run-through tracks. I've not seen anything specific on how CHSRA intends to implement those. I found the video on the NC3D website (http://www.nc3d.com/projects/ca-high-speed-rail-2.html). If you click on 12 on the video player and place your mouse over it, a pop down annotation indicates that that simulation is indeed Los Angeles Union Station. Of course, by no means does a video suggest that the CHSRA has selected an option. The idea of run through tracks at Union Station has already been studied, but not with HSR in mind. Ugg, I've been looking at the station on Google Earth, the end of the platforms is almost spitting-distance from the Hollywood Freeway. Perhaps the best way is to effectively cover over the freeway for a short stretch with a structure wide and strong enough for all ten tracks plus elevated HSR tracks on top. It would require a whole lot of concrete and rebar, but it would insure plenty of capacity for the southern approach for years to come. Union Station does suffer from some space issues, but those issues largely result from the fact that ticket machines are not placed in locations that encourage efficient foot traffic. The Gold Line is an especially bad culprit, as the line often spills out onto the Metrolink/Amtrak corridor. But that's a solvable problem, and TAP will probably resolve a lot of this issue once people get comfortable with it. Get Metro to move their fare machines further into their part of LAUS and to fully staff their offices on the Patsouras Plaza side and things move much better; same goes for Metrolink. LA is a major terminal station - is it really such a large problem that trains will have to turn around coming out of LA? People in San Francisco are more transit-oriented, and making a transfer there is less likely to discourage traffic, but I'm loathe to do that in LA. Not to mention the fact that any LA station has to recognize reality and provide parking, which LAUS already has. LAUS has the capacity needed, it's just not presently being effectively utilized. In addition, who's going to pay to build the extra track, to run the "Metro Black Line" ad infinitum? I'm not sure the surcharge route is a good way to go - pretty soon you have every town up and down the line demanding surcharges for all sorts of things, and it starts to look like airline pricing again. Amtrak Acela runs just fine despite the lengthy layover in New York Penn Station. It's obviously not ideal, but I'm not yet convinced that the cure is better than the disease. So long as they bring the tracks in and out of LAUS up-to-speed, it's going to be hard to do worse than Metrolink or Amtrak service through there. I didn't mean to bogart bgfa, apparently I accidentally copied either his idea or one of the FRA's plans ;p.
Leave the Cornfield park alone! LA doesn't have nearly enough parks as it is. And LA Union Station is going to get another four tracks if and when the run-through tracks get built, and a huge number of conflicting moves will get moved out of the station throat at that point too, making the congestion manageable, possibly even with a through-running HSR. Someone ought to run some simulations of what rail traffic will look like given future Amtrak, Metrolink, and HSR service levels. And in the absurdly remote future, I think the ultimate solution will be to electrify Metrolink and build a line in a tunnel, RER style, through Downtown and to the Westside, forming an express line to relieve the Purple Line. It really seems like there should be enough capacity in the existing station at grade. There are currently 10 heavy rail + 2 light rail + 2 rapid transit. (1) 2 full-length tracks could be added on the eastern side. In fact, one of those tracks already exists and just needs a platform. (2) A single full-length track could be added just west of the Gold Line tracks. (3) At least two short-length tracks could be added in the northwest corner, just north of where the Gold Line first reaches grade level. There are currently three stub tracks with short platforms there. The platforms could be lengthened to accommodate 4-6 car Metrolink trains. These additions would increase the number of tracks by 50%. Combined with a run through option on several tracks, Union Station's effective capacity could probably double. According to Wikipedia, LAUS currently hosts ~192 daily Amtrak/Metrolink trains. The CHSRA business plan projects ~220 daily HSR trains. So it would appear that LAUS would need to more than double in size to maintain the current capacity utilization ratio. But HSR departures are spaced more evenly throughout the day than Metrolink departures, so many of the new HSR trains would be arriving during periods at which LAUS has plenty of excess capacity. The main problem is that there would be a limited margin to expand Metrolink service at LAUS. It's amazing that a couple decades ago Union Station was just an empty relic, servicing a few Amtrak trains per day. To go there on a weekday is to witness a hustle and bustle not unlike the station in its heyday. Even the weekend sees a surprising amount of people using what was once an irrelevant historical landmark. There are challenges ahead but I think the future is bright for LAUS. Spokker: I read recently that Union Station is now serving more than 50,000 passengers a day, which far eclipses the number of passengers even in the 1930s and 40s. By comparison, Burbank Airport only serves about 16,000 passengers per day. Rafael: I was present for a short presentation in person at the DLANC board meeting in October, which was to provide information in advance of the election. Nowhere did they indicate that there was any kind of online version of the Union Station proposals, neither did they have any good renderings. The options were described verbally and it was made clear that no decisions had yet been made. I do hope that the discussion is made public soon. Where did all this nonsense about a HSR stub-end station come from? CASHRA studied a number of alternatives, and they selected the current configuration, specifically because it would allow a N/S approach with run-through of trains. No offense to whoever posted the original post on this one, but you are spreading mis-information. First off you imply that CAHSR is planning a stub-end station, and second, if someone didn't know any better, they would think that the plans you laid out are the official CAHSR plans. in response to your information regarding the State Historical Park, I've fleshed out the alternative based on an East Terminal with 10 run-through HSR tracks at grade. It would be connected to the main terminal via a short unmanned people mover running above street level, i.e. above the HSR tracks and at the same level as the diesel tracks. Giving HSR its own terminal minimizes changes to the existing one for the sake of adding HSR and avoids additional traffic on the access tracks into the existing terminal. See this map for details. nowhere do I claim that what I put on the map is based on information from CHSRA, quite the contrary. If you've seen a document detailing what they actually have in mind, kindly provide a link. I believe everyone one this blog would like to know. FYI, the run-through tracks already approved by FRA are for the level with the diesel trains. The HSR level would be above that, so far all I've seen is a video kindly edited by Michael that that would have run-through tracks, though it's unclear where they would put those in addition to the four for the lower level. YOU LEAVE THAT PARK ALONE! HOW DARE YOU SUGGEST RIPPING IT UP! PEOPLE LIKE YOU GIVE RAIL A BAD NAME! That "undeveloped park project" is in fact a beautiful and fully functioning park, heavily used by the public. Furthermore, it is owned by the state, not the city, and is undergoing more construction for the future. IT IS OFF LIMITS: NO EXCEPTIONS. Far from operating at capacity, Union Station is still quite under utilized. Most of the time, only one or two trains sits at the platforms. Indeed, so few trains come and go that Tracks 1 & 2 were converted into the MetroRail stop for the Gold Line. The place where the Gold Line runs under Broadway has no room for another set of tracks. Likewise, there is no room on either the east or west for more platforms to be "squeezed in." FRA waivers will be impossible to obtain, especially after the disastrous crash in Chatsworth. The ticketing jams are easily solved by reopening the old ticketing hall, the currently closed North Wing of the station. It is in excellent condition, has the ability to process checked bags and is BIG. It is occasionally used for filming, but other than that, nothing else. please see the map I just added as UPDATE 2. It leaves the park alone by locating the HSR platforms in bend next to the river. Hopefully that is more acceptable to you. I assume by your blog post that we should ignore the alignment shown in the Google Map representation on the official CAHSR website? I am looking for the details on the Union Station run through alignment on the CAHSR and will try to post it if I can find it. This goes way back to the older environmental studies and preferred alternatives analysis. When they were looking at the routes between LAUS and Riverside, they were considering a few options, mostly between the Metrolink 91 Line route (selected CASHSR route) and the Metrolink San Berndadino Line route (along I-10). One of the reasons they selected the 91 Line route was because of the N/S approach into Union Station. The other route would have required HSR trains to travel south into the station from Riverside, then back north when the trains were headed up to Fresno/NorCal. Part of the reasoning was that they wanted Union Station to be a run-through station, where trains can travel from N-S without turning around. The current "run-through tracks" project is only related to Amtrak/Metrolink. This has nothing to do with CAHSR (although it should). Between LA Union Station and March ARB, each of the alignment options considered utilize existing freight railroad alignments and the HST would be either in or immediately adjacent to the freight railroad right-of-way. The UPRR Riverside/Colton alignment option is preferred between Los Angeles and March ARB (see Figure 6.5-1). Comparing the two alignments between Los Angeles and Pomona, although the UPRR Riverside/Colton option is a more heavily used freight corridor (with more freight related constraints and future potential for freight expansion) than the UPRR Colton Line, the UPRR Riverside/Colton option would provide a much better connection to Los Angeles Union Station (LAUS) and to Northern California (since it connects to Union Station from the south). The UPRR Colton line enters LAUS from the north, and would likely require a direction reversal using LAUS as a stub-end station for trains traveling from the Inland Empire to northern California thereby could increase travel times between these markets by at least 10 minutes with the recommended HST station at LAUS. Between LAUS and March ARB, the alignment options considered would have similar potential for environmental impacts. The Riverside/Colton option would have the least potential costs, about $1.2 billion less than the Colton Line option (see summary table Section 6.5.1). For the segment between Ontario and March ARB, the UPRR Colton Line (considered part of both the UPRR Riverside/Colton and UPRR Colton alignment options) would provide considerably higher speeds and faster travel times (estimated at 6 minutes less between LA and San Diego) than the option that would directly serve San Bernardino. A direct link to San Bernardino is estimated to cost $700 million more (than either the Riverside/Colton option or the Colton option) and would not avoid or substantially reduce potential environmental impacts. I had not looked at the Google Maps version of the CHSRA route in a while because they had removed the actual route from that publication several months ago. For the benefit of other readers, the view is published here. In the vicinity of Union Station, the official map shows tracks running along the left (east) bank of the Los Angeles river. They vut over via a new bridge and through Mission Junction to the existing Union Station terminal, then cut back again via a new bridge near 1st Street. In addition to the high cost of adding a second level to LAUS, this alignment involves an awfully large amount of eminent domain seizures. Note that running along the right (west) bank of the river does not reduce the number of new bridges that must be built, they would just be located further from the station. Mike, Rafael, through-stations can have an amazingly high amount of traffic per track compared to terminals. Unless CAHSR has very long dwells, it can easily make do with 4-6 tracks at each station. 220 daily HSR trains means that there will be a train leaving LAUS every seven minutes, 24/7. If the trains shut down overnight and have lower frequency outside rush hour, we're talking about a train every four minutes during peak hour. Color me skeptical. I would trade that rinky dink park for the LA River restoration project any day. Build HSR right through that park for all I care, if the LA River is improved. The interesting thing is on page 19 (as labeled, not actually page 19 - the doc is split across multiple pdf's. See http://www.cahighspeedrail.ca.gov/library/Default.aspx?ItemID=7669 for the full list). Basically your East Terminal concept is what they call Option 4, I believe. They don't like the pedestrian connection due to the jail complex between the two (although you attempt to alleviate that concern with the PeopleMover). One advantage of the "East Terminal" station is that HSR could avoid running on the terminal lead tracks through CP Mission and CP Terminal, as well as avoiding diverging movements through CP Chavez and CP San Diego (I'm assuming shared track going into Union Station, but if it actually ends up being two-levels then maybe there will be no shared track). I'd think that might save 2-3 minutes. Given that the marginal cost of SF-SJ improvements is something like $1 billion for every 5 minutes, the time savings alone might be worth $500 million. But they might be somewhat illusory because it could take passengers an extra 3-4 minutes just to get from the east terminal to LAUS on the people-mover. thx for the pointer. It seems to me CHSRA can't really decide how to proceed with the LAUS station until they know who they can get a ROW through downtown LA from. Some combinations would apparently make getting to Anaheim and/or the Inland Empire very difficult, even though the reasons are not immediately obvious from looking at the satellite images. The county jail is probably not all that much of a problem since the undesirables are already locked up inside. The law enforcement building is more problematic in that pedestrians might not feel safe walking those streets. An elevated structure, whether it is used for a people mover or an enclosed walkway with moving sidewalks, would help avoid potential contact. Another option would be to choose a site on the left (east) bank of the river to avoid the construction of two bridges and the people mover. Instead, the subway would be extended across the river above grade using just one bridge. However, I'm not sure exactly how the subway runs under LAUS - an extension may or may not be feasible. Also, there is a large container transshipment terminal near Lamar Street, so providing road access to an HSR station there would be difficult. I just hope CHSRA can find a solution that doesn't maximize eminent domain procedures in an area that may be subject to environmental justice lawsuits, just so it can maximize the amount of concrete that can be poured. small time savings tend to matter more to operators than they do to passengers. If a people mover can provide adequate connectivity between the terminals (and beyond in the case of a subway extension), the primary benefit of an East Terminal on either side of the river would be avoiding expensive remodeling of the tracks at the existing terminal while it remains operations. Also, keeping HSR at grade reduces cost. Nevertheless, whatever solution is chosen for LA, CHSRA will also have to secure a nearby yard for overnight parking of its shiny new trains. Note that there may be some limited capacity in a utility ROW between Claudina Way and I-5 in Anaheim, close to the ARTIC station. the number I had read was up to 96 daily trains in each direction. That reflects ultimate capacity, not actual practice in the early years of operation. That number did not include high speed cargo trains, though. Minimum headway on new HSR lines is technically around 3 minutes, though AB3034 only requires a lower bound of 5 minutes. In practice, headways during rush hour will be more like 10 minutes. That may seem high by US standards but is perfectly normal elsewhere in the world. Some operators (SNCF, JR) prefer to deploy full-length trains with bi-level HSR rolling stock - well over 1000 seats - rather than push the envelope on headways. It's true that run-through stations have high throughput, so provided stations are designed for high pedestrian flows, even Los Angeles could probably make do with fewer than 10 tracks. I was basically just looking at how much room there was. In the East Terminal alternative, it would be trivial to dedicate an island platform to legacy FRA-compliant equipment, e.g. Amtrak Pacific Surfliner or Metrolink shuttles to Anaheim, Ontario/Riverside/San Bernardino, perhaps even LAX or Long Beach airport some day. This would increase line haul times for through services and reduce the required transfer capacity between the terminals. Alternatively, a few platform tracks could be eliminated from the concept and the space used for overnight parking instead, if no nearby rail yard can be found. If expansion at Union Station is integrated with putting in the planned through tracks for the regular rail service expansions, then it should be possible to reduce interference with platforms in use. The run-through track plan already forsees returning platforms 3&4 to use by shifting mail operations to a different site, in order to free the platforms on the run-through lines for use. Building the mezzanine for those platforms before they enter service can then allow them to be brought into service to fill in for the next set to get their mezzanine and elevated platforms, and so on, to the platforms for the run-through tracks. The run-through proposal has four tracks coming out of the station onto a trestle, then narrowing down to two ... a second level on top of that would be four run-through HSR tracks, with of course additional platforms possible for services that terminate/originate at Union, say 4+4. I love Union Station. I love the Mission Revival architecture, the old wood grainy interior, the Art Deco flourishes. I love how *busy* it always is. Whatever solution is adopted it's got to preserve Union Station's place as the hub of Southern California's transportation network. I still think that it would be feasible to have HSR terminate at Union Station. There's a few projects that have to come together for that to happen though. First, the run-through tracks are key. This means that trains from the north to south encounter no conflicting movements at all through the station throat, and also adds four more tracks on the east side of the station. The station would basically be separated into two parts: the through part (tracks 3-6), with two lead tracks from north and south expanding to four plafrom tracks, and the terminal part (tracks 7-16), with three lead tracks from the north, which will serve the San Bernardino and Riverside lines, long distance trains, and any trains terminating from the north. I think the capacity of the terminal part of the station ought to be enough for the foreseeable future. The capacity of the through tracks will largely be limited by station dwell time, which unfortunately will probably be realtively high given the need for schedule recovery time. But assuming a 10 minute dwell time, that's still 12 tph in each direction, and tricks like double-berthing Metrolink trains can push that a bit higher, to 15-16 tph. I think that's probably good enough to be able to avoid building a new terminal. And if one is built after all, I would suggest a location next to the Red Line yard, with a new Red Line station built adjacent, and platforms for both terminating trains from the south, and through trains continuing to Union Station, for convenient transfers. Oh, and I forgot to mention, with or without HSR, Union Station is going to need some major pedestrian circulation improvements soon. The main passageway is getting pretty crowded at rush hour. I'd suggest a direct passageway from the Gold Line to the Red Line, parallel to the existing main passage, and eventually a whole new passageway somewhere either north or south of the existing one. And in case anyone doubts the capacity of Union Station, just look at Penn Station in NYC, which serves something like 100 trains per day on 21 tracks. At the peak, there's 24 trains per hour coming from the west, and about 30 trains per hour coming from the east. Or look at the Jamaica station on the LIRR, with probably some 600 daily train movements, all fitting on to 8 tracks, with two of those tracks pretty much never used. If dwell times are the issue, and not track capacity, then breaking out the through tracks into four at grade and four in a top tier does not seem to be an extraordinary challenge. Given diesels at the ground level, cross promenades for cross platform access, above the grade platforms and below the elevated access would create much less of a tunnel effect than a continuous mezzanine. In terms of the new through track infrastructure, the A-1 alignment could be modified, with the ground platform tracks switching into the two outside tracks, as the elevated platform tracks dive down to ground level, and then those four into two as in the A-1 alignment. Also, for those of you not familiar with the LA Union Station area, there's actually a good reason that the run-through tracks project will only have four through tracks. Directly behind the stub tracks Union Station is the El Monte Busway, and right behind that is the 101 freeway. The busway rises as it goes from west to east, to match the level of the bus plaza and to go over the ramps onto Vignes St. As it is, the Gold Line tracks have to rise cross the 101, and the run-through project will involve raising the level of tracks 3-6 as well, which is why they need to build four new tracks on the east side to divert service to. A couple of other related Metrolink improvements also include a new layover yard by the river just north of the 101 (marked on your map as a potential HSR terminal). This yard will free up some midday track space at Union Station. Also, the Eastern Maintenance Facility at Colton will mean that the Taylor Yard will probably be mostly empty at night, making it a convenient place to store HSR trains. Finally, various improvements along all the lines that improve service reliability will allow shorter schedule recovery times at LAUS. I think on the whole, it will probably all fit, but that requires some assumptions about how things will be in 20 years. And that's why I would much prefer an incremental approach, let the system evolve, so you won't spend 20 years building something only to find that actually, you can't get schedule slots for your trains from San Jose to SF, or that you've built a hugely expensive new terminal that wasn't needed after all. Union Station was discussed at a long-ago Stakeholder Working Group meeting. I'll check to see if I have the notes. Basically, the two options were, as noted, the east station alternative and a stub track option. This was before Prop 1A though. After Prop 1A, the Technical Working Group for Riverside-Los Angeles has essentially been told that CAHSRA will use the I-10 SCAGLEV alignment, because of problems with UP Railroad and the need to reconstruct several recently-built grade separations for additional track. It will be interesting to see how what essentially will be a right-angle connection will be made. there's a freight line running from the Taylor Junction yard across N Mission Blvd and along the northern edge of I-10. It moves into the I-10 median at the 710 interchange and veers off at Baldwin Ave in El Monte. Reaching the I-10 median wouldn't be hard, as long as trains exit LAUS via the throat (northbound). The bigger issue is if the I-10 median is even available for HSR between the river and El Monte. If so, it would be possible to achieve run-through capability for all possible routes if the original concept of this post were modified to skirt the new park to the south and east. See this map of the LA Union Station North Terminal alternative. The northern access line would be on an aerial with transparent sound walls on top of N Spring St to avoid any impact on the park. Besides, railroads are part of the history of that particular place. Rafael: that "freight" line you mention is actually one of the few passenger-only mainlines around LA, and is part of the Metrolink San Bernardino Line. It would be interesting to see HSR use the alignment, as it's currently single track for most of the way, and expanding it would require taking away freeway lanes. There's also some pretty tight curves at El Monte, as the line turns off the straight ex-Pacific Electric alignment to an elevated structure along the river, then makes a 90 degree turn to land south of the UP line at the El Monte station. It would be possible, but potentially tricky, to bypass this area by staying on Ramona Blvd. Unfortunataly, the old (and straight) PE ROW has had houses built on it recently. it may not matter if the line is used for freight or just for commuter rail. All rolling stock on it must comply with FRA crash safety regulations, which the proven, lightweight, off-the-shelf HSR trains CHSRA wants to use do not. FRA normally prohibits mixed traffic, though CHSRA will be asking for a waiver on the short Fullerton-Anaheim segment. IFF a way could be found to shoehorn an extra pair of tracks next to the existing one between the river and El Monte, then presumably the HSR tracks would remain in the I-10 median to shortly before Colton. Note that service to Ontario airport would be compromised by an I-10 alignment, unless a people mover to the two terminals were built as well. Making that airport easily accessible via HSR was the primary objective of the Inland Empire detour. If it's going to end up an SFO-style CF because UPRR won't sell any part of its ROW, CHSRA should figure out how to extend the starter line to San Diego via the I-5 corridor after all - even if that entails stacking tracks in OC and tunnel construction between San Juan Capistrano and San Onofre. The Metrolink service in the Inland Empire could be upgraded fairly soon by adding some bypass tracks for increased service frequency and/or express service. A shuttle bus between the Upland station on the San Bernardino Line and the East Ontario station on the Riverside Line could bring passengers directly to the terminals. It's not equivalent to HSR, but it could be made available much sooner and at much lower cost. I was thinking of an elevated structure for the I-10, actually, from the 710 to Ontario Airport. Such an elevated structure would have 2-4 tracks of Metrolink and HSR, as well as two HOT "express lanes" in each direction that would add capacity to the 10. The problem is that the HSRA needs to move fast and start coordinating with the agencies, if I-10 is really going to be the option. The S 605/E 10 connector is likely to break ground in the next three years (the EIS was made final recently). One of the bizarre things I found reading that was that the power lines along the 605 freeway are apparently on the National Register of Historic Places, since they connect Hoover Dam with the LA basin. I never heard of such a thing before. I'm still trying to find the box where I put the notes. When I do I hope to send them to you soon. I am on the Stakeholder Working Group for the BNSF Anaheim-Los Angeles alignment (along with like 100 other people, including a bunch of Larouchites), but that has not been reactivated yet, although the Technical Working Group for the east alignment has. after all the delays in getting prop 1A on the ballot, it's not surprising that CHSRA now has to fight the asphalt guys for ROW. The political leadership that would normally set priorities is missing in action. As for your aerial structure, you can't make those arbitrarily wide. Even two lanes or tracks stacked above existing traffic lanes is something of a civil engineering nightmare in earthquake country. Besides, CHSRA has neither the remit nor the funding to pay for grade separating Metrolink or adding HOV lanes. As I said, if running HSR through the Inland Empire proves too hard and Ontario airport connection too crummy to be useful, the extension to San Diego should be in the I-5 corridor after all IMHO. It's much shorter and all trains would serve the primary population centers LA, OC and SD. Tunneling inland of San Clemente would cost a fortune, comparatively speaking, but that's life. Well, the greatest advantage to going inland to Ontario would be the expansion and connection possibilities. Las Vegas via Victorville could have an easy straight connection to San Diego. Arizona could jump on board with a connection to Phoenix and Tuscon via Yuma. All the "LAUS North" options are literally blocks away, in Chinatown. The East option is well beyond Union Station. I have serious trouble finding fault with an elevated second set of tracks compared to your ridiculous suggestions - move the station itself, to another part of town, with a shuttle feeder? On behalf of Angelenos, who, you know, USE Union Station, I'd like to say thanks for your helpful suggestions. 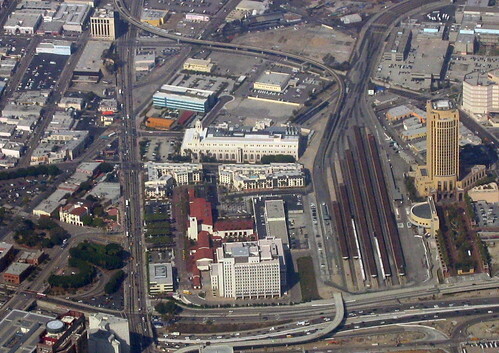 While we're at it, let's just forget about Transbay and have San Francisco terminate at the CalTrain depot. People won't mind walking, right? Or, you know, MUNI can always build a shuttle! Yeah, no thanks. We'll take Union Station, second story and all.